Lapis, Jasper, Garnet and Amethyst earrings, bracelet, necklace and close-up of necklace. Sterling Silver Lapis, Jasper, Garnet and Amethyst Necklace. Sterling Silver Lapis, Jasper, Garnet and Amethyst Bracelet. Sterling Silver Lapis, Jasper, Garnet and Amethyst Earrings. 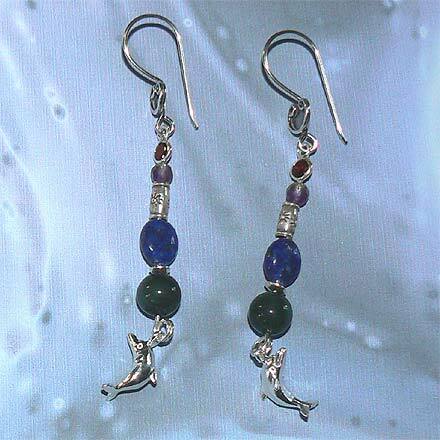 Silver Dolphin charms hang from the earrings and bracelet, which also has an ornate dolphin clasp. 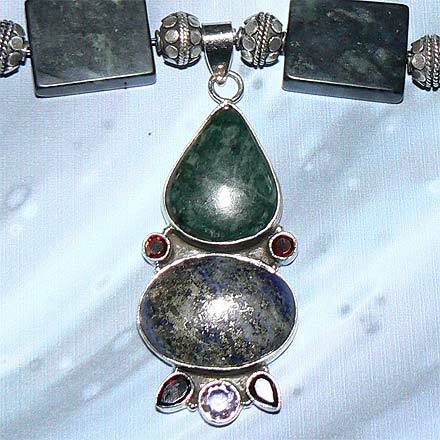 The dark blues of Lapis and greens of the Jasper is like the deep sea. For those who are interested in Astrological significances of stones, Lapis corresponds with Sagittarius and Libra, and is a traditional birthstone for the month of December; Jasper corresponds with Virgo and Leo; Garnet corresponds with Capricorn, Aquarius and the month of January, and Amethyst corresponds with Pisces and the month of February.